“Privacy works flexibly. It’s scalable. And it’s unique to every situation we’re in.” This is a recent quote from Leslie Bender, Chief Strategy Officer and General Counsel at BCA Financial Services during her presentation at Collector Live, in January of this year. The virtual conference for frontline and upper management debt collectors hosted several experts including ACA Director of Education Harry Strausser III. He spoke on maintaining a positive professional image–something that can be especially difficult in the collection industry. The conference also included Speech Pathologist Liz Peterson, who taught the crowd to use their voices as tools of persuasion when collecting a debt. Bender, known for her expertise in data security, focused her time at the event on a nuanced subject that doesn’t always get the attention it deserves. How much information is too much when you’re speaking to a consumer about a debt? As Bender discusses in the opening quote, there’s no set boundary for privacy. Guidelines for appropriate behavior can change from consumer to consumer, but they also vary based on the setting you are in. This makes the job of operations manager or staff trainer especially difficult. Policies and procedures are taught uniformly so every employee is on the same page. But there isn’t always one path to follow during your collection communications with consumers. Bender says the first step to improving interactions when you don’t have a blueprint is to acknowledge basic truths of your role. You are a problem solver – Collectors are first and foremost problem solvers. Every interaction you have with consumers revolves around learning their objections or barriers to resolving an account and finding a way to help overcome them. You are a consumer advocate – Collectors may be the best advocates consumers have. You are knowledgeable about the billing and collections strategies of the creditors you represent and as a result, are in a unique position to help consumers understand what alternatives exist to resolve debts. Understanding your role as a debt collector is step one. After you know your responsibilities, it’s time to be keenly aware of your perspective about consumers. How you view a situation can have a drastic impact on its outcome. 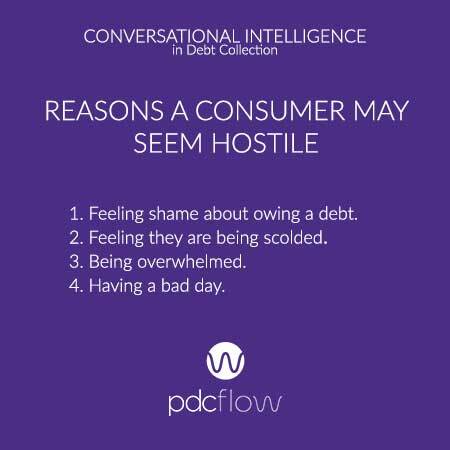 This is especially true of talking to consumers about owing a debt. Bender says there is one thought it is helpful to keep in your head during every collection conversation. Remembering this perspective will set you up for more positive calls. And after you begin thinking this way, it’s time to fulfill your role to advocate for consumers and to find a way to help them resolve their accounts. Not all accounts are resolved with payment. For example, if a customer alleges s/he has been the victim of identity theft, the role of the debt collector is to obtain key facts about when this fraud or identity theft occurred to assure the creditor is aware. In this instance, account resolution may include flagging the fraud associated with an account to avoid further collection activity on the account. When you speak to consumers, you are acting as a representative of your creditor as well as the industry. A bad experience during a call can reinforce the negative stereotypes consumers have about collectors. This negativity will act as a barrier to payment that may be hard to overcome. It is your job as a collector to recognize and–if possible–change these perceptions about your role and the impressions you leave with consumers. Active listening is important in finding a way to work with consumers so they may resolve their bills. Remember that we are all consumers and even something as simple as how you open a call may shape your success or failure in helping the person on the other end of the phone. Once you’ve done this, you’re ready to practice conversational intelligence. Conversational intelligence relates to how open you are to learning during each conversation you have. Being willing to learn from the person with whom you have a conversation is key to building trust–and trust can lead to mutual success during a collection call. While it is very important to respect the legal guardrails about how a call should proceed, it is arguably just as important to approach each collection call with an open mind. While you may have some ideas or biases before the call begins, recognizing them and recognizing how they could influence the information you take in during a call is super important. 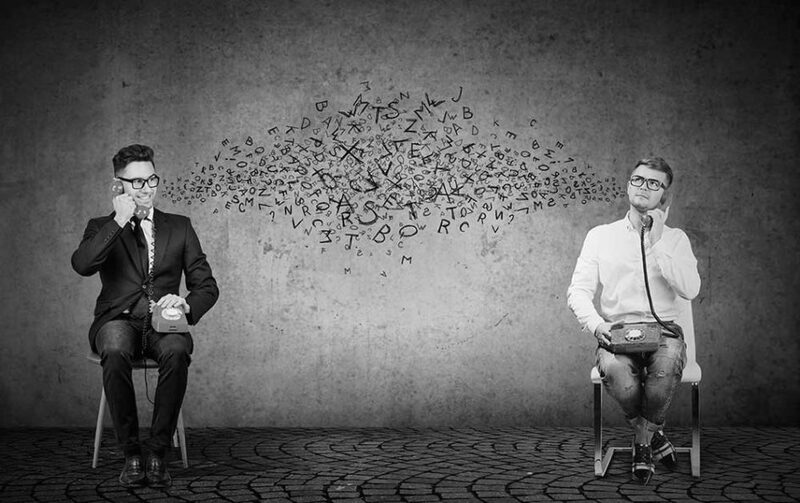 Conversational intelligence is all about “the hardwired ability in all humans to connect, engage and navigate with others,” writes conversational intelligence expert Judith Glaser. 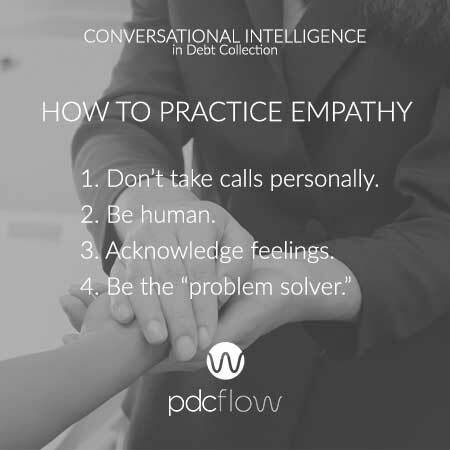 Developing better conversational intelligence skills is key to establishing trust and working with consumers (who are, after all, your customers) to help them resolve past due accounts. What are some tactics for honing your conversational intelligence skills? Never underestimate the power of empathy. Understanding a consumer’s perspective can help you find the root of their reason for nonpayment. Imagining yourself or a loved one in the consumer’s situation may help you understand their perspective. Once you have this insight, you will find connecting with consumers and offering help will make a world of difference. Another way to practice empathy is to avoid thinking of your collections team as “we” and consumers as “them.” Lawmakers and regulators who enforce consumer financial protection laws try to view situations from the perspectives of people receiving collections calls and letters. Collectors can get in the habit of doing this also. What are some tips to keep in mind? Don’t take calls personally – The first point to remember when practicing empathy: remove your own emotions from the equation. When consumers seem upset, you won’t know what they are upset about without active listening. The emotions people on the phone express may relate to their situation, not to you. Understand how your own emotions might bias how you react to an emotional person on the telephone. You could be the exact person who can really hear what help a consumer needs, provide it and get the account resolved. What if the consumer has complained repeatedly and all his or her prior detailed concerns have not yet been acted upon? That would be very frustrating for anybody–and you might have the chance on your call today to make a difference. Be human – While you must remain professional in your calls, you should also remember that you, like the consumer you are calling, are human. Make consumers understand that you are an invested advocate, not just someone scolding or judging consumers for their unpaid debts. Acknowledge feelings – It’s not enough to know you understand your consumer. Show consumers you call that you can tell they are frustrated and you want to help. This validates their feelings. Simply saying “I can hear you are feeling frustrated” or “Thank you for sharing” while offering to explain how you might be helpful can improve communication with consumers. Be the “problem solver” – Once you’ve focused on the consumer’s concerns, heard them and acknowledged how they may be feeling, it’s time to size a solution to fit the situation at hand. Use your expertise to tell the consumer what options exist to resolve an account. Asking for too much information would make anybody uncomfortable. Similarly, offering too much information can also make another person uncomfortable. In the credit and collections world, there may be lots of data available about the products, services or credit arrangements that led to the account you are looking at in your collections system. Some of the information may be sensitive and lots of it may be non-public. Striking the right balance between asking for and sharing the “need to know” amount of information is an important skill for the conversationally intelligent collector. Bender suggests a few guidelines to ensure you’re maintaining personal boundaries. Understand the person and understand your role – Be empathetic and fulfill the role you have been given. You are the conversationally intelligent collector trying to understand what obstacles may have impeded the earlier resolution of a past due bill. You are also the person who knows exactly what options your creditor clients make available for getting unpaid bills resolved. Listening to the consumer (and even imagining how you would see things if you were in the consumer’s spot) will help you understand their personal boundaries that shouldn’t be crossed. Measure the information – Measure the information you’re sharing and requesting against your need to know. Even if a consumer feels comfortable, there is some information you may not need to ask for or share to help consumers resolve their debts. Want to share this information with your staff? 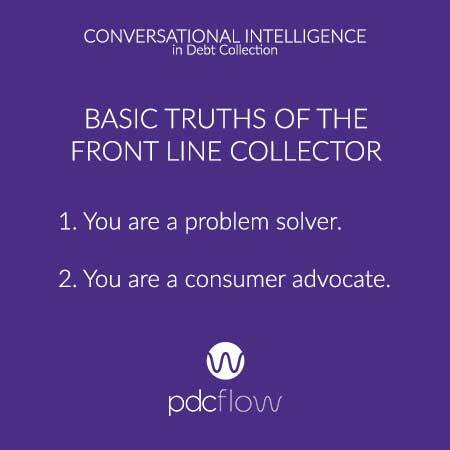 Download the Conversational Intelligence in Debt Collection Guide. For more information on Conversational Intelligence, considering reading Judith Glaser’s book “Conversational Intelligence: How Great Leaders Build Trust and Get Extraordinary Results.” To take a class or workshop with Leslie Bender, view the course offerings she has written or instructs as an ACA International Certified Instructor at www.acainternational.org.